One of the strengths of the book is the way that the authors convey a vision for how the slow church can further God’s work of reconciliation by deeper engagement with ethics, ecology and the economy. This framework encompasses critical aspects of life that the church has often left unaddressed. One example is the suggestion that the church should be a place where people help each other to find vocations. Much of our lives are spent working at our jobs. The church should lead the conversation that helps guide people toward meaningful work. Another focal point is the idea of the church as a local presence. The changing economy, access to transportation and the way we approach our careers has led many to believe that local is dead. The Slow Church counters this development by emphasizing the value of the church in its local setting. Just like food carries the flavors of its context of origin, churches reflect the demographic realities of their locale. When congregations resist the urge to move to the greener pastures of a better neighborhood, they are able to welcome the natural diversity of their location. While churches can learn from the examples of other congregations, there is no shortcut or automatic system to help them represent Christ’s body in a particular place. The way that the authors describe the church’s relationship to a local setting seems primarily to present examples of smaller churches in less populated areas. Their point could have been stronger if they evaluated more examples of churches working in transient urban centers, like Los Angeles, to show how the slow church can build community in a place where long term locations are not often economically possible. One of the challenges of discussing issues like the church’s relationship to ecology and economics is the political conversation that this naturally raises. At first this seemed to be a distraction from the central focus of the book, which seems more bi-partisan, but another way of looking at it is that you cannot take a holistic view of life in community without having the courage to raise political issues. Some sections, like the one discussing the redistribution of wealth, may cause some readers to pull away but hopefully it will stimulate more dialogue than division. Slow Church relies heavily on quotes from a wide variety of sources. Although these quotes add color to the book, at times it seemed that they carried a little too much of the content’s weight. The authors did provide a convincing case for their thesis in the introduction and the first chapter, however, so this helps keep the reader oriented through the rest of the book. 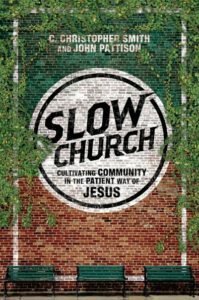 If you care about where your church is going and want to see it become a place that impacts every area of local life, the Slow Church is for you. Christopher Smith and John Pattison have shared from their own experiences in community insights that will help us to choose the slow and patient path of discipleship over the shortcuts of speed and efficiency. I highly recommend the book as a thoughtful expression of what it means to be the church as a group of people that God has gathered to collaborate with him in bringing reconciliation to the communities in which we are planted.